Throughout the world is expanding the consumer’s demand of a higher level of water quality and quantity. The source of water greatly varies from country to country and in some areas, where no surface or underground soft water is available, desalination of sea water is the dominant process for drinkable water. 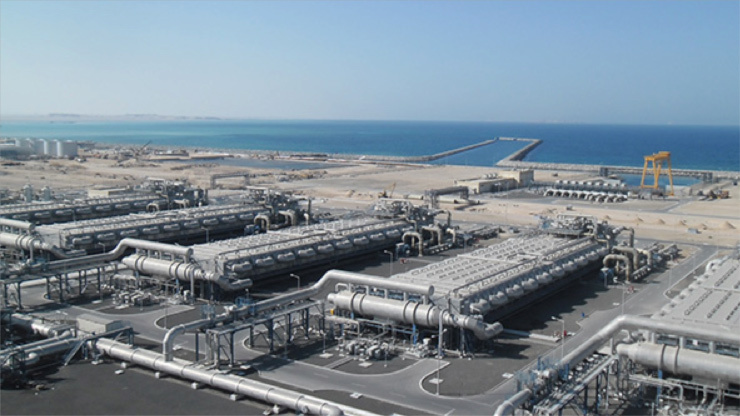 Desalination is a process that removes dissolved minerals (including but not limited to salt) from seawater, brackish water, or treated wastewater. A number of technologies have been developed for desalination but, at the end, pure desalinated water is acidic and is thus corrosive to pipes, so it has to be mixed with other sources of water that are piped onsite or else adjusted for pH, hardness, alkalinity and disinfectant residue before being piped offsite to comply with potable water regulation. Recently bromate ion was found in drinkable water produced from salty sources. In this context, chlorine dioxide, a powerful disinfectant and oxidant very well-known and utilized worldwide since 1960, can result decisive to overcome many a problem arising from seawater desalination for human purposes. The two major sources of bromates in drinking water are: using in the disinfection process ozonation, when bromide ion is present in raw water, and sodium hypochlorite solutions especially when produced by electrolyzing sea water. Bromate has been classified in Group 2B (possibly carcinogenic to humans), is mutagenic both in vitro and in vivo. Provisional guideline is 0.01 mg/litre (1.0 ppb). The guideline value is provisional because of limitations in available analytical and treatment methods and uncertainties in the toxicological data. There is therefore a need for alternative disinfectants for such a kind of water able to maintain the same level of microbiological protection and to minimize the presence of by-products. Bromate is an increasing public health problem in some parts of the world where drinkable water is produced from salty sources. The use of chlorine dioxide is very promising to solve this problem and to increase the quality of the distributed water. It has been confirmed, both in Lab and in industrial practice that this powerful disinfectant/oxidant is very stable during the time in the pipes and, consequently, the formation of chlorite is very low and well under the WHO guideline value. Chlorate can be minimized adopting new production technology able to form highly pure chlorine dioxide solutions. Chlorine dioxide, in the conditions usually encountered in drinkable water production from salty source, does not oxidise bromide and, consequently, no formation of bromate can be detected with this chemical. Besides, it is well known that chlorine dioxide does not produce TTHMs and, in comparison with chlorine or hypochlorite solutions, decrease dramatically the AOX content.